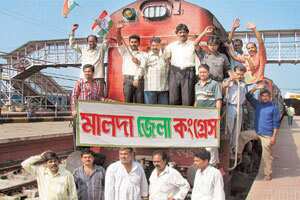 Derailing industry: Protesters block a railway track in Malda during the Bengal bandh called by the opposition on Nandigram on Monday. Kolkata: Weeks of unabated violence in the Nandigram region, topped off by a statewide shutdown on Monday, have left companies betting on West Bengal second-guessing their plans. While none of them is saying they are reconsidering their investment plans, they say that any failure of chief minister Buddhadeb Bhattacharjee’s government to bring life in the east Midnapore region back to normal at the earliest would start eroding confidence in West Bengal. “The state has seen too many bandhs (closures) in a very short duration," said Goutam Sengupta, chief operating officer of Videocon India Ltd. The state has seen five shutdowns already this year. “They project a very negative image of the state. Our confidence in Bengal hasn’t been eroded at all till now, but it could happen if the situation persists." Videocon has three factories and a special economic zone (SEZ) in the state, with three more in the pipeline. “Despite whatever the state government may claim, the bandh culture never went out of vogue," notes Aditya Agarwal, director of the Rs1,600 crore Emami Group, which has interests in cosmetics, toiletries, health care and real estate. “People live in fear whenever a bandh is called and it’s something we have come to accept." Emami’s factories in the state recorded a mere 10% attendance on Monday. Still, Agarwal is optimistic. “In the short term, there might be some jitters, but long-term investment will continue to flow in," he said. Notably, Monday’s bandh paralysed the state’s showcase information technology (IT) industry in the satellite town of Salt Lake. Until now, IT services had been spared by bandh organizers, irrespective of political affiliation. In New Delhi, Prime Minister Manmohan Singh spoke to state chief minister Buddhadeb Bhattacharjee over telephone on Tuesday to ascertain the latest situation in Nandigram. Nandigram, where the government tried to forcefully acquire land for the creation of a industrial hub in its race to attract investments in manufacturing, has been the trigger for many of the stirs. Widespread farmer protests turned violent and caused fatalities that catapulted the district into a symbol of the struggle against rampant industrialization and the fate of those rendered landless by it. The government was then forced to abandon the plans for an industrial hub there. “It’s too early to say, and Nandigram is too localized an issue to say that investors will change course from Bengal," said Surajit Roy, senior vice-president of real estate giant DLF India Ltd, whose offices remained closed on Monday. “As long as Nandigram is handled sensitively, I don’t think it will have an impact. If it is mishandled and becomes a macro issue, then it could be a different ball game." “The general feeling is that something wrong has happened and expressing one’s protest in this way is a part of the democratic process," said Gautam Chatterjee, the West Bengal state council chairman of the Confederation of Indian Industry. Chatterjee is also the director (industrial) at Exide, where attendance had been close to 70% in the three factories it has in the state. He insists that investment in the state wouldn’t be affected, saying: “This was an aberration, but, by and large, investors are happy with the stable situation afforded by political continuity in the state." Not everyone sees it that way, especially those who work with overseas investors. “Such strikes send out a negative signal to potential foreign investors," said British deputy high commissioner to eastern India Simon Wilson. Businesses are also starting to echo popular sentiment that forcible acquisition of land may not be the right approach. If land is forcibly acquired for a “public cause such as building a road or an airport, it’s fine, but not to help someone else set up a business", said Agarwal. Exide’s Chatterjee said: “Land losers should not feel cheated when they see land acquired from them at Rs3 lakh an acre changing hands a few years down the line at Rs2 crore an acre."